For those of us who were educated in the American school system, we all had to study American history. In our history classes we learned about the founding fathers, their ideas and how they led the American Revolution. We also learned about the Civil War and how the institution of Slavery was finally dismantled. We learned about the Industrial Revolution, World War I, the Great Depression and World War II. And we probably made a few stops at other wars and events along the way that most of us forgot. In short we learn about the military, economic and industrial history of America, but how many of us ever learned much about our nation’s philosophical history? And yes, we do have one. The American nation is a fascinating experiment in philosophy. America was part of “The New World” and the people who first arrived here (and for the purpose of this short discussion I will leave the issue of the Native Americans aside) found themselves in a struggle for survival. The consciousness that emerges in those on the frontier is part of the bedrock of the American mindset. On the frontier what is most important is what you can do; knowledge is useful because of what it can help you accomplish. In this atmosphere philosophy tends to be a luxury. And so deep in the American psyche there is an anti-philosophical and anti-intellectual bias. As Americans we pride ourselves on being can-do, no-nonsense, straight-shooters, but not necessarily as complex and profound thinkers. Then came “The American Founders” – Benjamin Franklin, Thomas Jefferson, John Adams, George Washington, James Madison, etc. These men were fueled by the exciting new ideas that had exploded through French thinkers especially Jean-Jacques Rousseau, and the European Enlightenment in general. They had new thoughts about the powers and rights of the individual and how society should be built by and in service of individuals, not a ruling class that lorded over it. So into the frontier consciousness you add the philosophy of the enlightenment and you get the impossible event of a successful American revolution. Still, as proud as Americans may be of the events that brought this country into existence we remain surprisingly unaware of the development of our philosophical ideas since that time. After the American Revolution it is probably true that for the majority of people philosophy revolved around the frontier philosophy of utility and common sense. This philosophy is captured perhaps most notably in the pithy sayings penned by Benjamin Franklin such as: a penny saved is a penny earned; early to bed, early to rise makes a man healthy wealthy and wise; etc. Others, who had the luxury and the interest to explore philosophical ideas may have studied the great works of European thinkers and translated and interpreted those ideas for America. But something else started to happen as well – a genuine American philosophy began to form in the hearts and minds of a few ingenious and inspired individuals who had the courage to break from the ideas of Europe and carve out a way of looking at the world that had a uniquely American flavor. The story of how those ideas developed and the people who developed them is fascinating and profound. The ideas themselves sit deep in the consciousness of all Americans – they are part of our inherited collective perspective on life. Sometimes they lead to our most noble acts and other times to actions either by individuals or by our nation that most of us would agree represent far less than our most noble aspirations. The filter of our culturally inherited values and ideas can be an asset or a liability depending on the circumstances we find ourselves in, but we must be aware of that filtering mechanism before we can tell the difference. What every American needs to know about American Philosophy is that we have one. That it is rich. It is complex. It can be either an asset or an obstacle. And most importantly that it is already a part of who we are and how we think. If we strive to understand it we will be in the best possible position not only to use it, but also to develop it toward more and more splendid forms. This blog is devoted to an ongoing exploration of that genuinely American Philosophy; how it developed, how it can be seen in action (good and bad) today, and how we can make much better use of it by understanding it deeply and putting it into conscious service of our highest ideals. 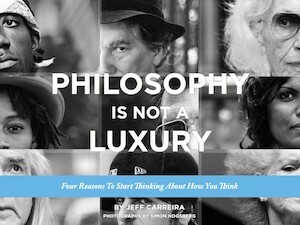 Jeff, In your excellent blog on American philosophy you cover a number inspiring American philosophers. Another that belongs somewhere down that list is Corliss Lamont, in recognition of his contribution to the powerful and growing movement known as secular humanism. Corliss Lamont (1902-1995) was a twentieth century American philosopher authoring “The Philosophy of Humanism” in 1949, the first of his eight editions that became the standard text on the subject. Lamont earned a PhD in philosophy in 1932 at Columbia University where he studied under John Dewey. Dewey was a signatory of the Humanist Manifesto I in 1933 and Lamont was a signatory of the Humanist Manifesto II in 1973. Lamont was director of the ACLU from 1932 to 1954. As a civil rights activist, he won court decisions over Joseph McCarthy, the CIA, and the Postmaster General. Politically (and lamentably), Lamont was a far-left Democrat, a socialist, and an expert on and sympathizer with the Soviet Union. “To define twentieth-century humanism briefly, I would say that it is a philosophy of joyous service for the greater good of all humanity in this natural world and advocating the methods of reason, science, and democracy. While this statement has many profound implications, it is not difficult to grasp. Humanism in general is not a way of thinking merely for professional philosophers, but is also a credo for average men and women seeking to lead happy and useful lives. It does not try to appeal to intellectuals by laying claim to great originality, or to the multitude by promising the easy fulfillment of human desires either upon this earth or in some supernatural dream world. But Humanism does make room for the various aspects of human nature. Though it looks upon reason as the final arbiter of what is true and good and beautiful, it insists that reason should fully recognize the emotional side of human beings. Indeed, one of Humanism’s main functions is to set free the emotions from cramping and irrational restrictions. First, Humanism believes in a naturalistic metaphysics or attitude toward the universe that considers all forms of the supernatural as myth; and that regards Nature as the totality of being and as a constantly changing system of matter and energy which exists independently of any mind or consciousness. foundations of a flourishing economic order, both national and international. Thank you for this fantastic comment on humanism. I have heard of the philosophy of Humanism, but don’t know much about it. It sounds like after Dewey this is the next thing to tackle. Who is considered the originator of Humanism? I would say humanism has no single originator. The roots of humanism are traced through history in Corlis Lamont’s “The Philosophy of Humanism”. I will send you the pdf. And I’m looking forward to learning more about Dewey. Write on!